Half-Off Adoption Fees all Month! 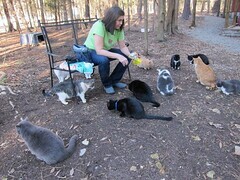 In honor of “Felinetine’s Day,” this Goathouse Refuge is discounting our adoption fees by 50% all month long! That’s $50 for your soul mate, your furever friend and constant companion. Check out all our adoptable cats and kittens and pay us a visit to meet your favorites. Sweet Mustache (left) and her friends are waiting for you! Don’t wait: reduced fees expire at the end of February!